Meet my new “find”: the awesome painter Rodney Taylor. As a Virgo, I do not routinely paint totally from memory. While a memory can evoke very specific imagery, it is often affected by emotional coloring that distracts me from establishing an image of the place that is somewhat recognizable. (I’m basically a landscape painter.) I certainly can, however, attest to the strong feelings place can play in a work of art. I think memory and place combine in the work of Rodney Taylor. Born in Buffalo, New York, Taylor moved to New York City, where he lived and worked for 16 years. He studied at the Cooper Union, Fashion Institute of Technology, Bard Annandale-on-Hudson, and the Skowhegan School of Painting and Sculpture. A large part of Taylor’s work is heavily impasto impressions of elements of urban life and decay. He also often combines images of trees with his architectural imagery. The tree image also appears individually in his paintings. 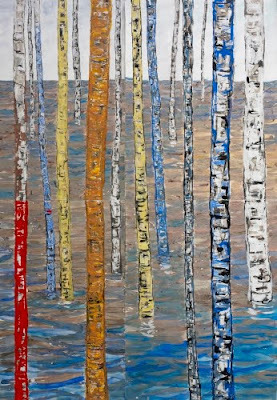 Although many of Taylor’s paintings address urban imagery and symbolism, his paintings of birch trees stem from personal reminiscences. They recall memories of trips with his family to Maryland for family reunions. 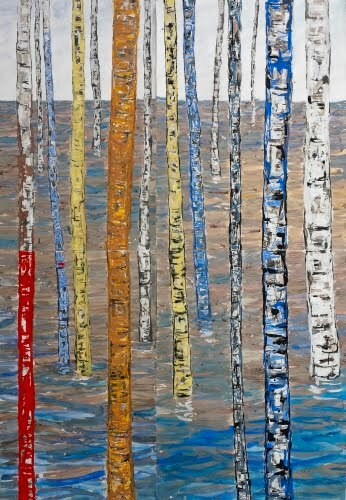 The birch trees represent his remembered views of trees flashing by the car. Taylor’s more recent work has taken a decidedly abstract turn and a more muted palette. These works seem to be influenced by urban architecture.